Ice and Cold. The two things you absolutely adore. You were born to skate on ice, but before you can show everyone what you are made off: you applied for a job at the Ice Rink in your neighborhood to get a little bit of a head start before trying out for the team. Put your gloves on! It is time to clean the ice rink. Well, all you really do is sit on a ice machine which shaves the ice clean from scratches. As a skates lessor, you lend out, repair and sharpen the blades from skates. Every once in a while you get to test out new skates before others can buy them and try it out. Your job as a receptionist is to sell tickets to customers, answer the phone and also collect all the new packages that get delivered by the front door. Your eye land on a folder that is left behind by your co-worker. They are looking for new ice skaters to compete in important competitions. Did your co-worker leave that behind on purpose? Or did they really just forget to bring it with them. Either way, you thank them silently for thinking about you. Today is the day to show the coaches that you are no joke and actually can twirl on your skates. You have to move fast because you actually called in sick for work, you let your favorite co-worker know what the drill is so they can cover for you if your boss ask any questions. Now, put on your skates and show them what you got! You did it! You convinced the coaches to let you on their team and compete. All what is left before the biggest championship is here is to shape up. This consist off working out twice a day, eat healthy, do some healthy test and many more things. After your try outs and receiving the good news you get called to the office, your boss isn’t really happy with what you did and how you did it, but your new coach convinced your boss that you could be the next big thing. Well, if you would work for it of course. You promise yourself not to let them down. The WNB Junior Championships is around the corner, all the new athletes get to show off their moves and skating skills. If you do your best and if you rank in the Top 10 you will qualify for Nationals. The WNB National Championships is around the corner, in the last big competition you ended up on the 7th place, however you need to do better this time because only the best 5 will qualify for the World Championships in London next year. The WNB World Championships is finally here, in the last competition you ended up on the 6th place. Normally you won’t be competing now, but one of the contestans got caught using drugs and the board dropped her from competing in this match and gave her spot to you. You need to focus, because the best 3 will qualify for The Olympic Winter Games in Vancouver. It has been a long journey for you. From working at a Ice Rink to try outs and competing in the biggest championships. You are at the top and this will be your final chance to show the world what you got. 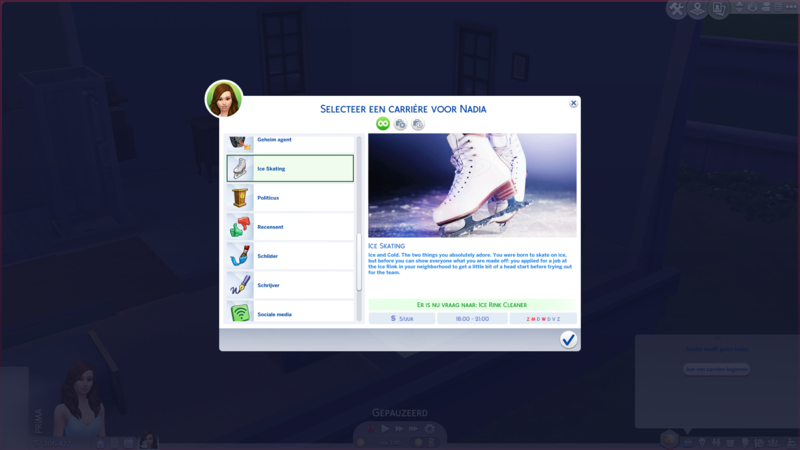 Put on your skates and steal the show! You did it! You won a gold medal at the Olympic Winter Games and now everyone wants to know your secret. You get invited to do some interviews on radio and tv and you get to go on tour to teach kids your technique and how to become the best of their kind.